Finally….Atlanta introduces its newest addition, a pay-per-use co-working space , Post-Office! 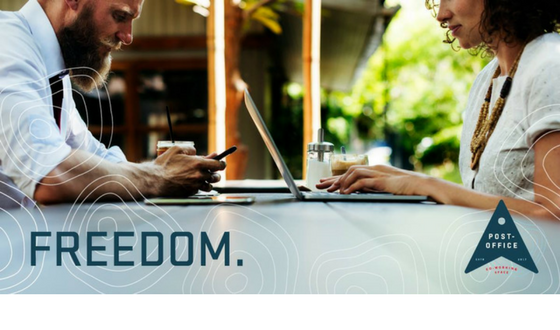 Founded by ATL based tech-marketing pioneers, Michele Grant and Marcus Henderson, the innovative space allows for entrepreneurs and career adventures alike to work everywhere and however they want without the hassle of signing that oh-so-dreadful contract. A career adventurers dream come true, really. The real clincher though? Several locations. Designed to fill voids in unleased and empty real estate throughout the city, the hub’s first location will open in just a few short weeks on Pryor Street at Underground Atlanta, with other hubs launching soon. Contract free + multiple locations to choose from? Talk about a double whammy. Through partnerships with CORT Furniture + Radio Roasters, the spaces will be dressed to the nines with first-class furnishings + fueled by a local-roast coffee that features single-origin, rotating options to explore as new varieties are harvested. See, even the coffee is innovative. For more details, check out the release.